Micromax is a well growing Indian electronics manufacturer. The company is famous for their low cost Android smartphones and tablets. Recently they have started making LED Smart TVs with their own trademark technologies like AVEA engine. Most Indian people love the Micromax products as they can fulfill there telecommunication and multimedia needs with a less cost when compared to other brands in the market. 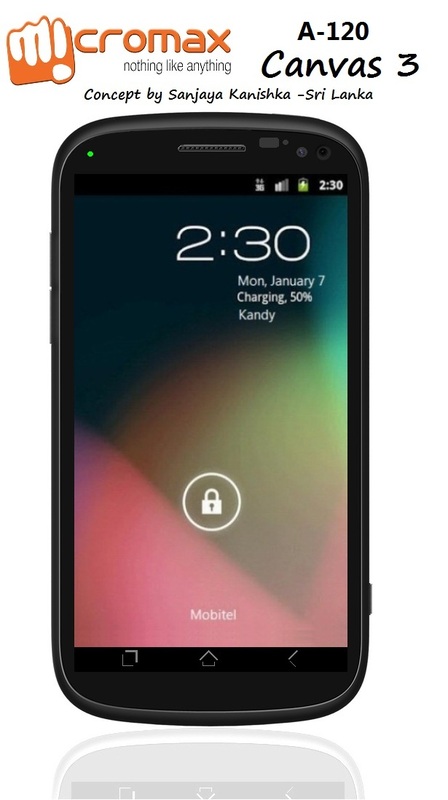 Micromax A110, also known as Canvas 2 was the flagship device of the company. Canvas 2 was able to grab a good market share and still selling like hot potatoes. 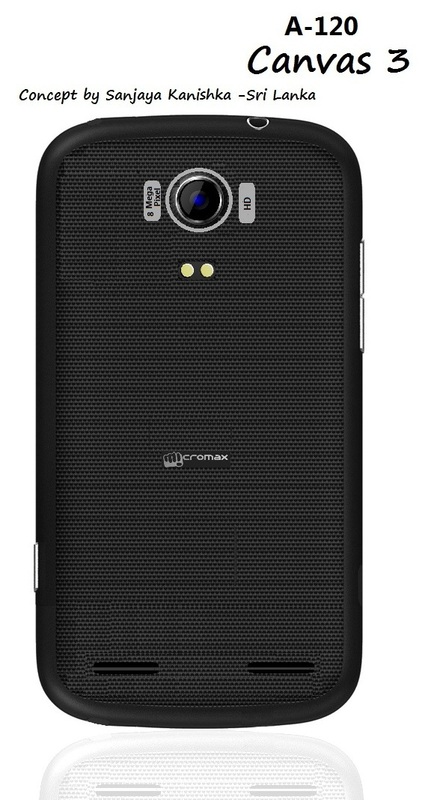 However when competing with the modern standards, i think Micromax needs to improve their hardware as well as software. The Canvas 3 Concept takes the "Canvas" Branding to the next level with high end+mid range features. As you can see, from the front side,there are so many changes with improvements. Physical capacitive buttons are removed and replaced by software integrated buttons. This helps to reduce the height /length of the device and makes more compact in the hand. Ambient light sensor is next to the front facing camera,now no need to adjust the brightness manually when you go out side. Here are the most interesting and improved features of Canvas 3 over it's previous sibling. Powered by a Mediatek Quad Core processor, Canvas 3 is much faster and power saving device, thanks to the new Cortex-A7 architecture. This is one of the low cost quad core chips in the world. Next feature is the most interesting one. the "AVEA" engine. Similar to the Sony's Bravia engine, it helps to enhance the image and music quality of the device. 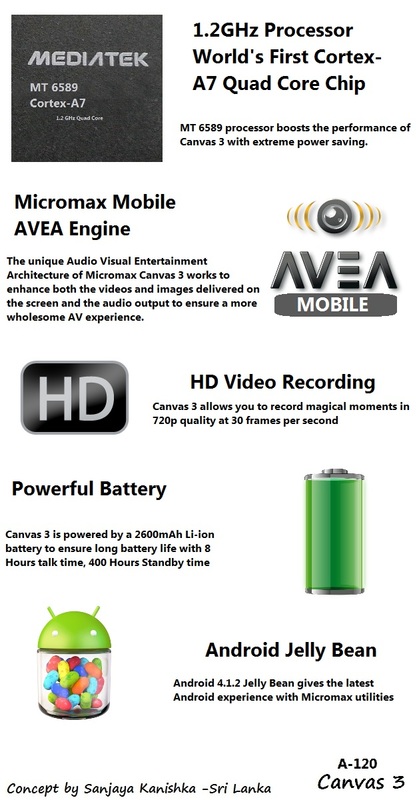 Micromax LED Smart TV's features the AVEA engine and i imagined a mobile integration of it. Back side of the device has a rough pattern just like in canvas 2 and there are two speaker grills at the bottom. Since Canvas 3 has AVEA engine, i put two speakers to ensure great music quality from the handset. I used the model number A-120 to follow the Micromax Canvas lineup with the margin of their model numbers. I have seen somewhat lag when toggling between homescreens in Canvas 2. specially when active wallpaper is running. With the project butter in Android Jelly bean, this could reduce and gives a smooth interface. To maintain the affordable price i could not add high end hardware as you expected. Finally Canvas 3 will be a Good phone for everyone for their daily needs. feel free to post your opinion and suggestions for the Canvas 3 in the comments. What will be the cost of this device? ?..and when it will launch? Hope it will realese soon. . . . . . I dont like the back side.wish it will get a plain back side. A am using mmx a110 very good feature low cost I am expect canvas 3 super HD display and HD full recording 1080 pixells and battery 3000 mah up and cost will be 14000 rs. And no metter 14000 rs.